Straight Blast Gym of Niagara is proud to host SBG President and Head Coach Matt Thornton for a Brazilian Jiu Jitsu Seminar on September 24th and 25th. A 4th-degree BJJ Black Belt, Matt is one of the most sought-after martial arts coaches in the world. It's the radical way in which many people find their personal style of training evolving, changing, and growing for the better – even after just a weekend of training with him – that make his approach so unique. This seminar is open to all teams, affiliations, and levels of experience. 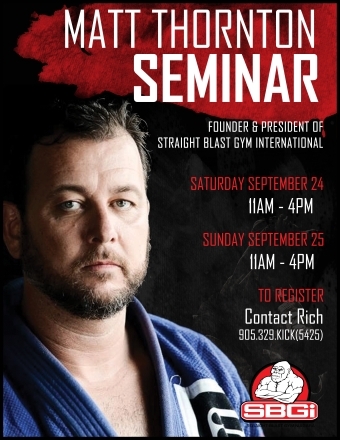 For registration information please contact SBG Niagara Head Coach Rich Beaupit at 905.329.KICK(5425).